Jakarta – PT. Toyota Motor Manufacturing Indonesia (TMMIN) today formally rolls-out the highly anticipated All New Sienta from its production plant in Karawang Plant 2 in a Line-Off Ceremony attended by Minister of Industry of the Republic of Indonesia Saleh Husin, Karawang Regent Cellica Nurrachadiana, PT. Toyota-Astra Motor (TAM) Vice President Director Henry Tanoto, and TMMIN President Director Masahiro Nonami. 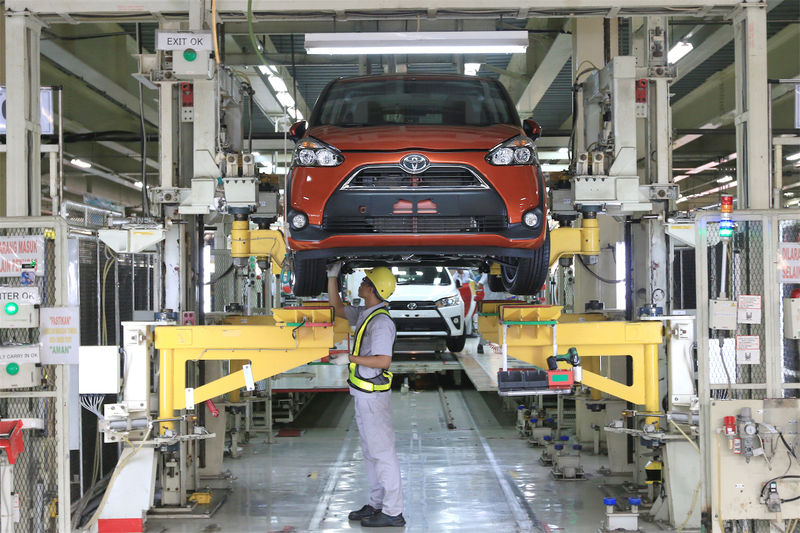 Toyota invested approximately 2.5 trillion Rupiah (USD 186 million) for Sienta production at TMMIN Karawang Plant 2. The model, first introduced to Indonesian customers by PT. Toyota-Astra Motor (TAM) last April during the Indonesia International Motor Show (IIMS), will be the 6th Toyota model manufactured locally by TMMIN after Kijang Innova, Fortuner, Etios Valco, Vios, and Yaris, on top of 2 gasoline engine models TR-K and R-NR. “We are very proud to be able to produce many models here in our integrated manufacturing facilities. It is our sincere hope that by increasing the number of locally made model, we would be able to further contribute to the development of Indonesia automotive industry and the economy through transfer of production know-how, human resource development, and new investment including those in our local suppliers,” said TMMIN President Director Masahiro Nonami. Since November 2015, with the production of the All New Kijang Innova, followed by the All New Fortuner, then the new aluminum gasoline engine R-NR, and now Sienta, the number of first tier local suppliers involved in TMMIN production process jumped from 107 companies to 139 companies. Employment in TMMIN increased by 400 people and total investment reached approximately 9.7 trillion Rupiah (USD 722 million). Indonesia is first country outside Japan to produce Sienta. It is manufactured in TMMIN Karawang Plant 2 which also housed Etios Valco, Vios, Limo, and Yaris production. The production plant is equipped with up to date technologies such as Servo Line in Stamping and Piano Welding which enhance precision, safety, and efficiency that help ensure the global quality of TMMIN’s made vehicle. The R-NR engine that powered Sienta is also locally made at TMMIN’s newly minted Karawang Plant 3 which is the first Toyota engine plant to have all engine production processes under 1 roof. Indonesian made Sienta will also be exported to countries in South East Asian region starting later this year. It will enrich Toyota exported model line-up from Indonesia which currently consist of Kijang Innova, Fortuner, Vios, Yaris, Avanza, Rush, Agya, and LiteAce. Up to June 2016, CBU (completely built-up) export of these Toyota models from Indonesia reach 83,800 units. TMMIN also export its engines, CKD, and component parts with export volume for the first semester of 2016 reach 69,700 units, 20,800 units, and 43 million pieces respectively. Last year, Toyota models, with an export volume of 176,000 units, contribute to approximately 85% of CBU export from Indonesia. The series of local production and export shows the trust given to TMMIN’s capability in producing global quality products that fulfill the needs of customers both in Indonesia and in export market. “We are very proud to have the trust as one of Toyota global production and export base for vehicle and engine in Asia Pacific. However, we need to work even harder to guard this trust, to continuously increase our quality and competitiveness so that Toyota operations in Indonesia could cater our customers better and grow together with Indonesia automotive industry,” added Nonami. The newly produced Sienta already reach a high local content level at 80%. This is achieved through the continuous development and close collaboration between TMMIN and local suppliers. “We are in awe with the hard work done by our local supplier companies. It is not an easy process that we have to go through together in developing a global model with high local content, from dynamic change of work culture, continuous race in latest production technology, the ever increasing demand of skilled man power, and many more,” said TMMIN Vice President Director Warih Andang Tjahjono. TMMIN dedicated up to 100 employees from 6 organization functions to share skills and knowledge on automotive manufacturing know-how and human resource development relations to increase the competitiveness of the 139 first tier local suppliers. From these suppliers, the skills and knowledge are then expected to be shared to approximately 600 companies that compose the second tier local suppliers. These efforts to transfer skills and knowledge are projected to strengthen the supply chain in automotive industry.